Opening the throttle instead of getting stuck! Because good is never good enough for UNIFLEX, the Karben-based systems developer for hose production has now added a convenient feature to its well-known motor-driven UWT 2 hose coiling reel. With the new UWT 2.2, the coiling speed can be continuously adjusted in both directions – from 0 to 50 rev/min. 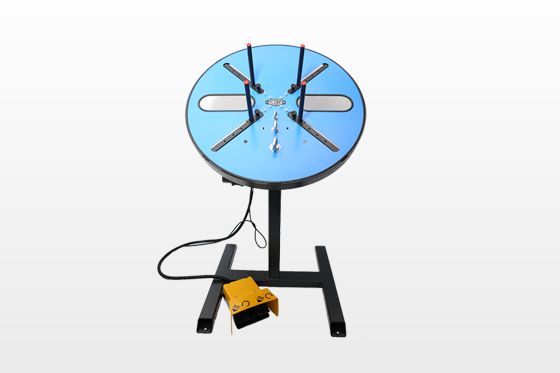 As before, there are two foot pedals for the operation of the electrically driven rotation of the coiling reel in clockwise or counter-clockwise direction. The UNIFLEX hose coiling reel is used for the easy winding and unwinding of hoses up to a diameter of 1 ¼ inch. Five-position centering bolts, eyelets in different sizes, a bearing face diameter of up to 65 cm and big recess grips that facilitate the fixing and handling of the hose coils ensure maximum workplace ergonomics. A mechanical slip clutch, the protective cap of the pedal and the screw connection to the floor are the most important safety features. A suitable UMS 4 hose length measuring device including floor stand is available separately. Thanks to its solid and, at the same time, compact design, the 70 kg coiling wheel with its maximum carrying capacity of 80 kg is a highly appreciated work horse alongside every UNIFLEX hose crimper, ensuring a reliable return on investment thanks to its high robustness – just like all UNIFLEX devices! Visual marks that conform to the relevant standards enhance process safety in the production of hose lines. 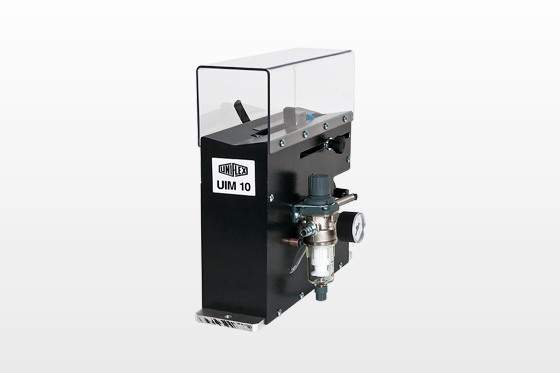 With the UIM 10 marking machine, UNIFLEX offers a compact, cost-effective solution for the insert marking of a wide range of hydraulic hoses up to 2" in diameter. The reliable insert ensures that the hoses are positioned and marked precisely. The machine can process up to 700 hose ends per hour, which is three times more than can be done by hand! In addition, machine marking is also much more precise than manual marking. The compact and sturdy UIM 10 workbench machine has been designed for the line marking of socket ends, clamp positions, etc. on hoses up to DN 50. Protected by a transparent cover, the pneumatically operated punch applies the marks at any distance between 10 and 150 mm from the hose end. The marks are produced by inkjet printing, using a proprietary ink retention film. The ink cartridges are available in six (colour) versions and are easy to exchange.